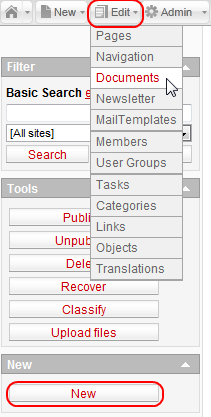 All files uploaded to AxCMS.net are considered documents. They can be text files, images, flash movies, PDF files, etc. You can upload new documents by going to New -> Documents OR Edit -> Documents and clicking the button New on the left side of the overview page. On the Document Detail page there are six sections that represent different details and editor options relevant to the file. Some additional sections appear after the document has been saved and/or published, some are influenced by the file type. We will take a look at default each section; additional details and sections that depend on the state of the document or are file specific will be explained accordingly. By clicking Browse you can select a file from your PC or from a local network. Clicking Upload uploads it to AxCMS.net. Clicking Enter... opens a popup where you can upload a file via remote URL. Enter a name for the document. 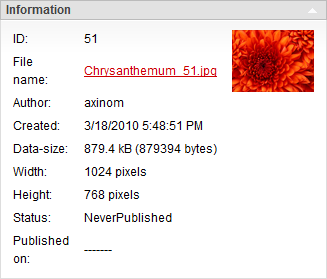 If no name is specified, the original file name is used. The name of the document can be changed at any time by editing the document. You can set here where the document can be deployed: to both MS and LS or only MS. 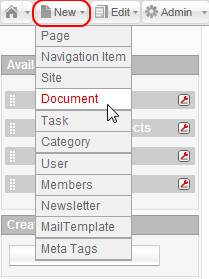 Select a navigation item to link to your new document. Having already defined your document as standard document for a navigation item, you can ignore this point. If you do not want to define the document as a standard document for any navigation item and link the document only by a text or image link within the content area of a page, then here you have the possibility to select a navigation item to be highlighted by the new document. Opens a page where you can see the rights of users. The unique ID of the document. Consists of the name of the uploaded file and the document ID. Username of the user who uploaded the document to AxCMS.net. Actual file size of the document (in bytes). Current status of the document in the system (Published, NeverPublished etc.). Here you can enter terms that you want the index search to find the document by. These terms are independent of the terms in document content. You can enter text here. By template functionalities these texts can be used in the context of the documents. E.g. 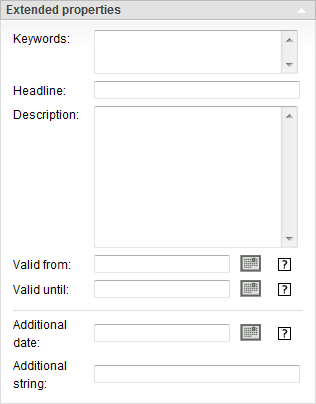 description can be used as a standard text to describe one image on all pages. By default this is empty and without function. Here you can define the time frame in which the file will be accessible in the LS. By default this is without function. Saves the document and takes you to the Document Overview page. Saves the document and reloads the Document Detail page. Takes you back to the Document Overview page. No changes are saved. Opens a new Document Detail page for creating a new document. Returns the document to unpublished state. 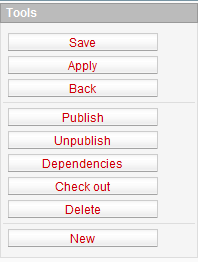 Lets you check the dependencies of the document. Checks the document out, so other user are not able to edit it. Deletes the document. If the document was published before, Delete only marks it for deletion. To remove it completely, the document has to be published. You can export information about documents to an .xml or a .csv file. To do this, go to Edit -> Documents, select the document(s) you wish to export, choose export type and click Export.